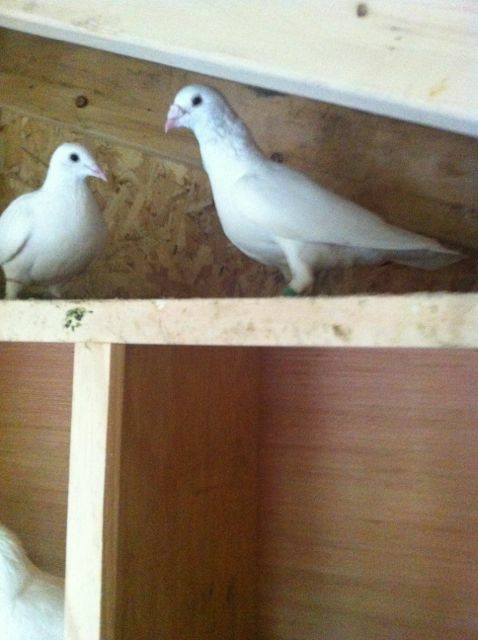 Our pure white doves are a variation of the Columba livia domestica species and are also commonly referred to as homing pigeons. Homing pigeons are trained from a very young age to fly home to their loft. Training is only a small part of what makes these birds come home. Since ancient times, humans have raised pigeons promoting and strengthening the homing instinct generation by generation. Our doves are pure rock doves whose homing instincts have been fine-tuned for generations. Please never release a dove that is not bred for homing. Some have purchased pet store doves that could not survive once released outside. People have made this mistake with unfortunate results. To make this harmful mistake is not very lucky either. Scientists believe homing pigeons may hear wind blowing over mountains that are hundreds of miles away. The homing pigeon has a rich history of bravery and distinction. One of the most famous homing pigeons in the world, Cher Ami, has a display right here at the Smithsonian's American History Museum. If you can, ask some of our country's "greatest generation" how important homing pigeons were to their effort. Please read my journal to learn more about the bravery of these little birds. How are the doves able to "home"? Scientists are still studying how these birds are capable of finding their homes from hundreds and even thousands of miles away. Most likely it is a combination of extremely excellent sight, scent, and sensing abilities. This remarkable bird is able to sense magnetic fields, subatomic sounds, and quantum level particles. Did you know the Coast Guard once employed rock doves for finding lost people at sea? Did you know that homing pigeons have such excellent sight that they can see well-over 26 miles? How has this innocent white bird struck such a chord with humanity? Doves mate for life, are incredibly loyal to each other and work together to build their nest and raise their young. Because they tend to nest in areas that humans can watch, people picked up quickly on the virtues that the doves shared; they found them to be dedicated, honorable and peaceful. They are equal partners and devoted parents. Both parents bring straw, walnut leaf-twigs called petioles, pine needles or other local materials to build a very thin nest on a flat ledge. Both parents incubate the eggs: mom at night, dad for half of the day. Both parents feed and protect the youngsters. What happens at the dove's loft? All of our doves are banded. A band is one sign of a responsible dove owner. The band is used to identify the dove and to help find his home if he is lost. Much like the tags on a dog's collar. The bands don't bother of interfere with the bird's life. They are placed on them when they are five-days old. If you have found a lost bird with a band, please click here for information on how to find his owner. Racing homing pigeons are fast. They have been clocked flying with a 92.5 mph average over a 400 mile race. If you look closely, you will see one of the bands that all our doves wear. This is the band with our phone number.